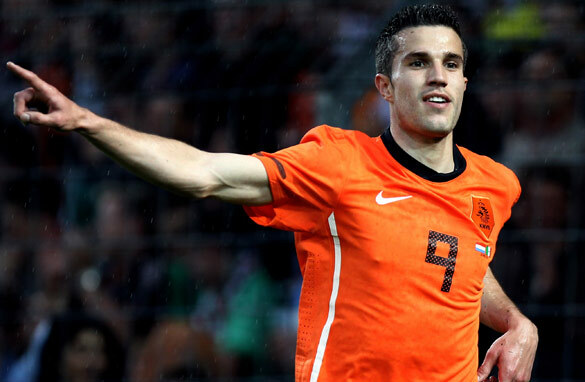 Robin van Persie could be playing in a World Cup final, according to CNN's Pedro Pinto/Getty Images. Johannesburg, South Africa - I have arrived in Johannesburg and soccer fever has started to take over my mind, body and soul. The blaring of the vuvuzelas outside my hotel has helped me get in the mood. With the World Cup kicking off in just a handful of days, I feel inspired to reveal my predictions for the South Africa event. After successfully picking Italy's Internazionale to win the European Champions League, I hope my crystal ball is right again as 32 teams start their quest for the solid gold statuette on Friday! I am not old enough to remember the magical days of Clockwork Oranje, when the Dutch national side dazzled planet football with their awesome combination of skillful passing and dynamic movement. It was dubbed "total football" for good reason. The Netherlands lost back-to-back World Cup finals in 1974 and 1978, and that heartbreak has not been forgotten by a nation who has constantly flattered to deceive in FIFA’s showpiece event. Now, however, they have all the ingredients necessary to come out on top. In my opinion, this is an extremely balanced side. Arjen Robben's impact has been keenly anticipated, and even though the Bayern Munich winger's chances of beating injury to take part now look slim, there are so many weapons in his team’s arsenal. Robin van Persie should be raring to go following a season where he rarely played for Arsenal. Wesley Sneijder must be on cloud nine following a historic treble with Inter for whom he was instrumental. And let us not forget the influential Mark van Bommel who sets the tone in the center of the park. Defensively, they have plenty of talent as well. John Heitinga and Joris Mathijsen have formed a solid partnership in the center of defense. One final word about the coach. Bert van Marwijk has been able to nurse some big egos in the squad and convince his players to work hard for each other. Do not forget the Netherlands have not lost since September of 2008 and that momentum will help them immensely in South Africa. Not many people have talked about either of these sides leading up to the World Cup, but I believe they will turn some heads and can both make the quarterfinals. Let’s start with Serbia. They have the right mix of experience and youth in a squad which offers veteran coach Radomir Antic plenty of options. Their defense is led by tough tackler Nemanja Vidic and their midfield is marshaled by Champions League winner Dejan Stankovic. Add giant striker Nikola Zigic and speedy winger Milos Krasic to the mix, and you have a very dangerous team. Uruguay will also surprise a lot of football fans. They have enough quality to navigate pass an unpredictable first round group and can reach the last eight of the competition. With experienced coach Oscar Tabarez calling the shots, and Diego Forlan firing in the goals, this is a team that cannot be underestimated. La Celeste’s defense will be tough to beat. Diego Lugano is a lion back there, and their wing-backs Diego Godin and Jorge Fucile are extremely versatile. They have seven World Cup titles between them, but both Germany and Italy will be going home early in 2010. Without Michael Ballack, Joachim Low's side will struggle to assert themselves in the competition and won’t get past the quarterfinals. All of their strikers had poor seasons and I just don’t see too many exciting players in their line-up. As always, they will be solid in defense, but will find it difficult to hit the back of the net. As far as the defending champions are concerned, they could be heading home after the round of 16. They are old, slow and predictable. With midfield maestro Andrea Pirlo struggling for fitness, the Azzuri will miss a playmaker who can make a difference. Defender Fabio Cannavaro is past his best and the same can be said for most of the players in their starting line-up. Argentina will lose in the final to the Netherlands after beating Spain in the semifinals. The defending Euro 2008 champions could still win it all but they have had too many injury problems leading up to the World Cup. I can’t see their top players staying in top shape and top form throughout the tournament. As far as England are concerned, they will lose to the Netherlands in the semifinals, which would still be a good result for Fabio Capello’s men. After scoring a whopping 47 goals in 53 games in all competitions for Barcelona, Messi will light the tournament on fire. He has been criticized for his poor scoring record with Argentina (only four goals in qualifying) but that will change in South Africa. Diego Maradona will use him in a more central role and little Leo will shine like never before in his nation’s legendary number 10 shirt. One of the deadliest strikers in the game today, Villa will benefit from playing with assist master Xavi and he will score at least six goals in the competition. With Fernando Torres struggling for fitness, the new Barcelona signing will lead the Spain attack and celebrate plenty of goals in South Africa. I envision the perfect final: Spain – Brasil. Spain will defeat Argentina, and Brasil will dominate England. I completely disagree with you on this one. 1 germany and italy are not Underachievers they are the greatest teams in the world from brazil. germans and italians are not known for the fancy football but very effective at how they play their games and stopping other teams from wining. i would never count them out regardless for the teams they have remeber 2002,2006, euro 1996, and 2008 no one gave these teams a chance. 3-Player of the tournament – it wont Lionel Messi, barcelona has the best midefiled in the world, the dymanic duo xavi and inesta. argentina has the strikers at the world cup messi, tevez, melito, higuian and arguro but thier midfiled is not that good they have mascarano but the others are unknown -de maria, pastore r good but i doubt messi will be the player of a tournament . my guess could be robben if he travels, xavi or a goal keeper or even a defender like they the last world cup. 4 -Top scorer i dont know but i think klose from germnay could be , villa and torres are also contenders and so is fabiano from brazil. but klose has my vote he has 10 goals at the world cup and usully does well. Laughable to suggest that the Dutch can win the Cup without Robben. First of all, even if he hadn't gotten injured, history shows us time and time again that defense, moreso than a great attack, will bring glory. And Holland's defense is far from anything to brag about; their centerbacks are nothing but average and their fullbacks are flat-out poor. Moreover, they lack a clinical finisher up front. Van Nistelroy's best days are in the rear view mirror and Huntelaar is hugely overrated. Without the goalscoring threat of Robben, they wont advance beyond the quarterfinals. All it takes to beat this current Dutch squad is a competent squad with the will to attack them, put pressure on them, rather than sit back and allow them so much time on the ball. Netherlands? Come on man why dont your research your articles before you post them. Your lack of knowledge is hilarious.. Netherlands? I do think your wrong this time, if the the final game is to be Netherland and Argentina I think Argentina will win easy and can do it without Lionel Messi, just take a good look at the players and forget Diego!!!! P.S. I think Portugal will go very far allso!!!! I also have a gut feeling that an African team will make it to the semis. I bet it may be Ghana or Ivory Coast. Lets wait and see. I have to disagree with you concerning Messi and Netherlands. I believe both of them will perform wonderful in their first 3-4 matches, as they often do. With great offensive power and many beautiful goals. But have you seen the weak dutch defense against in their friendly matches? Just the goal they concieved against Ghana shows it: their weak spot is still their defense and will cost them the chance to win the cup. I believe it will happen against Brazil in Quarter final. Messi will show 1, maybe 2 good games, but will once again fail in the blue-white dress in quarter or semi finals (same problem as Netherlands). Winner of the cup? Spain/Brasil/England. And maybe Germany, when they seem weak and counted out, they always suprise everyone. Altough they had many injured players and a very young team. i sort of agree with pedro. at least let us have some-one out the so called favourites to win the cup. i hope it comes out true. Thanks Pedro – I needed to know who is favoured. So after reading this I am going with Spain and Argentina in the final. i'll be watching from Alberta Canada to see if your prediction of Netherlands vs Argentina (L) comes true. Isn't Brazil in your World Cup? Last time I checked Brazil had qualified and as they are the most-time winning squad of all times I guess, Mr. Pinto, that maybe they should be taken into your consideration. Protugal will be the winner in the world cup and Cristiano will be the Player of the tournament and the top scorer. Thanks for not mentioning Brazil... This way we can get to be champions easily without people watching us as close as other "top" teams... And I disagree about Leo Messi being named the best player... He can't do this being under a coach as bad as Maradona... If u think that Maradona was a great player for scoring the famous "God's hand" goal so we also should praise Thieery Henry for doing the same on the qualifiers... As simple as that. Just wanted to say, coming from the Netherlands, I sincerely hope your crystal ball is made from high quality crystal indeed. Winning is all about scoring more goals than your opponent, and luckily it seems we're pretty good at that now, especially with Robben probably being able to play after the group phase. Here's hoping Brazil has an off day in the quarterfinals. There will be an unexpected surprise from Germany. They may not win in the end, but they'll make it to the final. Italy, France and Spain will lose earlier. Switzerland might make it to the 1/4- finals this time and the winner will be either Argentina, England or Germany. U'll see Brazil and Germany on the final Day!The real analysis!I love Netherland But,My prediction goes to Brazil and German. Ofcourse he has Brazil in his predictions! Brazil will most likely face The Netherlands in the quarterfinales, and seeing that Pedro thinks that Oranje is going to take it all it would mean that The Netherlands are going to beat Brazil 😉 Hence the no mention probably. As a Scandinavian football journalist, I have to say Pedro that you have very sophisticated predictions. I also do believe in Spain, Argentina, Holland and England to qualify for the top spots. I definitely do agree with your arguments for Serbia, which have a good chance to go into the quarter-finals. Also a surprise team from group A could well make it to the top 8, either your guess Uruguay or Mexico. And please notice also a balanced underdog-team of Paraguay that could be not just qualify, but surprise Italy in their opening match, win the group and beat Cameroon/Denmark in the second round. However I see a total absence of Brazilian football team in your preview. I believe Brazil has a very compact and well-organized team with a lot of quality. Luis Fabiano could be the top striker of the tournament with Villa, van Persie and perhaps an Argentine challenger, be it then Higuain, Tevez, Milito, Agüero or di Maria. I'd have an eye on the young defender-winger Michel Bastos, who could be one of the surprise stars of Brazil in this tournament. With Dunga, skill, quality, and motivation before hosting their home World Cup in 2014, I do think that Brazil will very possibly be playing in the final this year. I fully agree with the comparison of Clockwork Orange Netherlands, who'll be one of my favourites, but Brazil in the quarter-finals is still a more credible option to win the possible tight and entertaining match – just like in '94 and '98. I wouldn't seek the underachievers from Brazil – but from Italy and either Portugal or Ivory Coast. Germany and France are also credible candidates for this place, but we have to remember that they've more than once been strongest under pressure as underdogs when coming from behind the favourites. I see a chance for a total failure and success in all France, Germany, Portugal and Ivory Coast – reaching the top 8, semis or even final – or as well not even qualifying for the next round. We shall see. Not a surprise Mr. Pinto would side with a Latin side, anyways I agree it will be Holland v England semi however it will be an England v Spain final with England getting outplayed but still winning the world cup by way of a 2-1 win and playing 11 men behind the ball with Puyol being sent off. England are the World Champions !! Pedro not mentioning Brazil or Portugal is strange, just because he is portuguese. Well, as an proud portuguese citizen, even so, my bet is for Brazil. i think one of the African Team will get to the semifinal....watchout. I know why Brasil isnt mentioned. They will meet the Oranje in quatres, so they will face their exit early. I admire Pedro's work as a reporter but he's not a fortune teller... How could forget to mention Brazil? I'm so sorry Pedro but I think that your bet is not accurate. All the teams u said have good chance to win this world cup but I don't think that Argentina will make it to the best 16... The players are fantastic but their coach is far from at least "acceptable" for a team like Argentina. My heart says that Brazil will win. But let the best be crowded. I think the Netherlands make a good chance to win the worldcup. Friendly matches are not comparable with worldcup matches, in the worldcup games level will be much higher. It's true the defense is the weak spot but with the strong mitfielder couple Van Bommel and De Jong they've got a extra defense line. Despite of Robben's injury i'm sure 'The Great Four' will dominate the opponents half. Pedro, I totally agree with your predictions. The best gouda cheese is made by the dutch! So they are the winners! Oh, are we talking soccer? So you can not leave behind the only 5 times champions – Brazil. Even when they have Dunga as coach and they leave their most talented players out of the team. People READ! Brasil was mentioned. But sadly enough there wasn't much more to mention that they will be send home after the losing the macht against Netherlands. England: Make it difficult for Rooney and England is history, sad but true. Watch the team of South Africa, they can be the big suprise. I agree: there will be a surprise, but it will come from the home continent. People who state that the Dutch defense is the weakest link are right. But, the link is not as weak as you may think. Heitinga has played a superb season, and Mathijsen hardly loses one-on-one duels with attackers (this has been analyzed by German researchers). On the right side of the field, you'll find Gregory van der Wiel, who is a highly talented player. In the friendly game against Mexico the Dutch lost a goal with our second line in the defense. Against Ghana, it was the only time we got into trouble, but we scored four (WITHOUT Robben). Thus, even though the Dutch lose goals, they often score more than their opponent. There is one weapon of the Netherlands that has been omitted: the team is very strong as a group. That is, it is not a team of individuals but a group of players who would like to fight for each other. By the way, the one who said that the Dutch are weaker than the second-line players of Brazil, should really watch some games of the Dutch. Isn't it nicer to see an attacking team that sometimes loses a goal than a team that is very defensive and hardly strikes at goal? Ghana will replace Serbia on the overachievers prediction. Like Serbia, Ghana is a blend of experience from the likes of Asamoah Gyan, John Paintsil of Fulham and Sulley Muntari (UEFA champions league winner with Inter) and, youth in the persons of Andre Ayew, Kwadwo Asamoah, Kevin Prince Boateng, Lee Addy etc. World Cup Stats: An European team has never lifted the world cup outside its continent and I don't see history in the making in this tournament......so while one of the great european teams may make it to the final, the world cup is going to the South American continent. Look out for Mexico also reaching far due to altitude in their favor. My head tells me: Argentina v England. My heart says: Cameroon v Spain. I'm sitting in wet and cold Cape Town – the vibe is electric and we can't wait for the Greatest Show on Earth to begin!! I don't know who is going to win – great pity that Drogba is injured...and that Rio Ferdinand is out!! My money is on Bafana Bafana (South Africa) – just because I am South African – after that – any African team that goes further and after than – ENGLAND!! You never know!! Soccer is a funny game!! Robben's injury is less critical than we expected, so big chance he will be back after the group phase, or even earlier. I hope we can keep this form throughout the entire tournament this time, instead of amazing the world in the group phase and then face a silly loss when the real tournament has started. Thanks Pedro for a refreshing prediction. After all, it's just that, a prediction, but at least it's different from the mainstream belief that it will be between Brazil, Spain and England. Argentina will be the champions. I also think your analysis of other countries is spot on, though Brazil will certainly reach at least quarters. Completly wrong Argentina?? Barely made it to the World Cup, Finals will be Brazil and Spain/Netherlands. Underachivers you forgot France they lost to China and shouldn´t even be in the World Cup!!!! Uruguay isnt that good!! Paraguay without a doubt will be the other Latin American overachiver!! There is no one mention of a single word in your "prediction" that make the difference: "Brazil". How could you did that ? Is this a joke ? I am assuming you wrote this before Arjen Robben got injured. Actually if the Dutch stayed injury-free the semi-finals would easily be possible for them. Without Robben, it is not so likely. Argentina, if they had a half-decent coach, could go in with an attacking 4-3-3 (front 3 Messi, Milito and Tevez with Aguero coming off the bench) which could frighten the living daylights out of anyone. Problem is they don't even have a quarter-decent coach. 1. BRAZIL! (the inconsistent Kaka, the gifted right back Dani Alves and nine "no-names"! When did they last go into a tournament with such a lack of star power?). 2. England (name the last time they got past the quarter-finals of any major tournament played outside England. And if the injury-prone Wayne Rooney gets injured, what other international class strikers do they have?). Team to beat, despite the "injuries" – Spain. Xavi was good enough to be MVP in Euro 2008 and the Champions League final in 2009, and he is fit. Always ignored by the pundits, ignored by his opponents to their peril. And they have good reserve strength as well. And look for at least one surprise team in the semis, and maybe even in the final. Do you think the defense of brazil is strong enough in the quaterfinal? Robben goes inside and shoot from a distance. Sneijder also. Van Persie who's back, after his injury 8 months ago. Van Bommel and De Jong (man. city) playing as defensive midfielders. The Netherlands are underrated by many people. I think the weakest link is van Bronckhorst, as leftback. Btw Robben said he thinks he'll will be okay about 7-10 days. South Africa-Bafana Bafana will be the surprise of the tournament! Nice comments, good knowledge of international football. But as a Portuguese and I know you are too, did you forget to include Portuguese team in your comments? This is only one man's opinion. He is a sportswriter-sportscaster and has the opportunity to se emany matches and players each year, but he can be wrong. We will all have the cxhance after the CUP to comment on his errors. To me, Spain has to be the favorite based upon their players in the last year or two in La Liga and the Champions League, and so forth. They did win the European Championship in 2008, but they have stumbled before. Brazil must be considered because of their history but their team doe snot look as strong as many times before. The schedule must also be considered. England must beat the USA in the group phase, which they are favored for, but if they do not then they likely get the chance to play Germnay in the round of 16. This just illustrates that the group lineups can affect the semifiunal and finals matchings greatly. you are a north-american. That´s the reason why you understand NOTHING about football. Pedro, have you ever heard of Brazil ? (five times world champion), guess not. Anyway, I think England and Spain are very strong will be with Netherlands and Brazil in the quarter finals. I dont understand why everyone is talking about Argentina, they barely qualified to go to the world cup, lost for Brazil 3×1 in Rosario (small stadium with the crowd only a few meters from the goal keepers just like Maradona wanted). It is very difficult to say who will win but for sure will be one of these four: Netherlands, Brazil, Spain, England. Wonder why you left Nigeria in your prediction, great talent exits in the squad. The underdog wins the group and move onto semis. Good luck to all. But Brazil is the final winner. Ready to bet? I don't think so.......don't forget the 2002 World Cup when Brazilian Team wasn't "one of the favorites" to win the tournament. He did not include all teams, since that is not possible. Probably, as most people do, he thinks Portugal will not come far. I honestly think Portugal will have difficulties going through the group stage. All of you! Keep dreaming!!! Nigeria will pull a surprice by deafeating the so called highly rated Argentinia in there first group match. Keep your eyes wide open.!!! Africa is not parading the world greats but be warned of some great surprises that will characterize the turnament, especially from Nigeria, Ghana, and South Africa.Write us off at your own cardiac failure. Remember Atlanta 96? Be warned!!! Pedro... Robben is out and what about the dutch defense? I mean come on brother.. The Netherlands? I love the clockwork orange but their defense is their weakness and sneyder does not get along with anybody... I am leaning towards Argentina.. although the problem with "Los Che's" is Maradona.. he has no clue what he is doing especially lining up Messi as a 2nd striker instead of on the right so that he can cut to his left like in Barcelona. England? hard to say... Great league, disappointing national team, the dark horse? Portugal maybe, Brazi, but Kaka needs creative help and that will be the end of Brazil.. eliminate Kaka and who is the creative player for Brazil? who? Germany? no. Italy? nope, they need totti eventhough he has no class and Delpiero is past his prime.... Spain? could be, but they are underachievers in the cup.... my top 3: Argentina because of Messi, England (Rooney) and Portugal. "you forgot to mention brazil".... mmm, well I think if he didn't mention brazil is because brazil will not make it! right? Brazil wins sixth game by hammering Argentina. Messi was closely marked and got stuck. Brazil is excellling for their great team work. Ah, Pedro has hit same "wish" button I hit – to see the Dutch finally winning the world cup something they should have done in 74' and could have done it in 78' (remember , an inch saved Argentina in the last two minutes of the first 90 mins when Nanninga hit the post). My ultimate wish is for a Netherlands vs Brazil final. As for Messi he will sadly not do anything and the same fate will befall Argentina. Radical picks Pedro. Too radical. You are suggesting that Maradona will lead his team to the final. Wow man! SORRY PEDRO... YOU GOT IT ALL WRONG...Netherland will not win because NO EUROPEAN COUNTRY will win in S.Africa. Historical Reason. No European country has won a World Cup when hosted out of Europe. Forget about the South American world cups, even USA 1994 and JAPAN-KOREA 2002 was won by BRAZIL. So, HISTORY says a non European Country will win it. I cant see an African or Asian country winning it so it will be BRAZIL OR ARGENTINA. This article is a joke. Not a single mention of Brazil? Not even as an 'underachiever'? How ridiculous. Pedro Pinto must live is Neverland or Lala-Land to think that Netherland can actually win this world cup. I give fair chance to Spain, Argentina and of course Brazil. i have a feeling that there will be surprises.... my money is on Ghana, Brazil finals.. I believe this World Cup will bring lots of surprises and some "minnows" will shine. Don't rule out Slovenia, Australia, Ghana or the USA. In fact, don't be surprised if Ghana and Australia advance from Group D.
FYI Pedro Pinto is Portuguese, and the reasons he picked the Netherlands and Argentina is because both teams have several stars that play in none other than Inter & Bayern who were the CL finalists. As well, and of course he will never admit to this he did not predict Portugal because it would be too obvious that he was favoring his countrymen, and more than likely would receive a lot of flack. Sure both teams are stacked with talent but so is Portugal and if they really want to win it they will be in the final with Argentina. Let’s also hope that FIFA does not derail their run also with questionable calls as very evident in past competitions. I'm from England, and as i hope to god we do win it, i cant see it. We're a team of induviduals. Best example is Gerrard and Lampard in midfield. Both exceptional players, but when they go together, they just do click. And as we rely too much on Rooney, if he gets injured...we are screwed. It doesnt help that our media put so much pressure on us before every major championship. I think England can get to the semi-finals, and ill be happy with that. Petrus, you know a lot about football but your predictions are biased. C. Ronaldo will be the best player of the cup and the final: Portugal vs Argentina. Agree With Angel. Pinto, your loco. The Dutch have no player even close to the quality of Cruyff today in day and have never been able, without a single strong personality to lead them, to make any sort of lasting impact on a major tournament. Spain is simply breathtaking and it appears that their injury worries are now not an issue. Even if they were, as long as Iniesta and Xavi and at least one striker, Torres or Villa, is healthy, they are still good enough to win. One of the best teams IMO is Spain, and we'll see them in the final against – Germany. They don't have Ballack and some young players with not much experience, but their last game was pretty good. So I predict a re-match of the Euro 2008 final, Spain vs. Germany. And the winner will be ... Germany. They learned from their loss two years ago. The World Cup is a different deal from the Champions League. As much as I admired your prediction that Mourinho would knock out Barca and Byern Munich, I think this is a different deal. This is not an intellectual or even rational exercise. These are not teams that have the luxury of playing a whole season together, the time for team progression is short and there are no home and away matches. That is why the World Cup is magical and more difficult to predict. It's all about what can happen ON THE DAY. This is also why great players make such a difference. Think of Maradona, Zidane, Pele, Ronaldo (Br). They all saved their teams from premature elimination and became World Champions. This is about 2 magic seconds, not tactical consistency. It's about the Messis, Ronaldos, Robbens, Rooneys and Xabis. One of those guys will make history. I think Ronaldo will be the hungriest and Portugal the most overlooked side. They have goals in Nany, Liedson, Ronaldo, Danny and Simao. If their defense holds water, they can challenge Brasil for top of the group. That would mean Brasil v Spain in the last 16... and a whole new ball game. England and Holland would prefer Brasil to Portugal, remember? A lot wrong in this article. However, one I particularly think is way off is Serbia. I don't think they will do well at all. You can't just look at a team by looking at all the big players. A team of average players with good teamwork can beat a team with good players with bad teamwork. Serbia doesn't have good teamwork. New Zealand proved this by ripping them apart in the friendlies. In addition to this, Serbia is in a group where all the other teams that have good performances recently and have good teamwork. Serbia chances are actually not that good. Fortunately for Spain they have the deepest bench of all squads. Spain has, undoubtedly, the best squad and will be extremely difficult to beat. However, nobody knows what will happen. I just hope they don't have the kind of referreeing they had back in 2002. Brazil, of course, Argentina, England and the Netherlands are of course serious contenders. Italy will be gone in first round this year! Surprise teams will be Chile and Slovakia. Final 4: Brasil, Argentina, Spain and England. Champion: Spain which will defeat England! your football knowledge is good but your analysis is average. To do a world cup prediction without mentioning the greatest footballing team in the world (Brazil) is unheard of. England and Argentina will struggle in the world cup. Messi will underachieve as usual. and it will be a Brazil vs Spain final. Holland surely can go all the way ! There are not many teams with such quality in their squad as Holland. Well i hope the Dutch will win! it's about time! agree with the final not sure yet with the winner, of robben is out holland is dead!! Maradona will finally be at peace....but will have to live with the fact that Messi will be a bigger legend than him and probably the best player to ever play the game..
go go Argentina for MEssi get the third world cup throphy !! Sorry guys, but it will Spain Vs. Brazil in the final. If no injury time, Spain will be the champs. If it goes to penalities, Brazil will take the cup. FINAL : Brazil vs Argentina. Brazil is the 2010 World Cup Champion!! African teams will be tough to beat in this World Cup. Bafana Bafana, Black Stars, Super Eagles, Desert Foxes, Elephants and the Indomitable Lions could do the unthinkable. Why not ? Let's enjoy the vuvuzella sounds. Mr. Pinto Im sure by now uv hrd that its Africa's time. An African Country can n wil win the world cup especially if they keep a cool head. NIGERIA WILL WIN THE WORLD CUP and let me assure you; there is nothing like luck but it is DESTINY. It is not Brazil's time and at most they will get to the Round of 16 or 1/4 final. not a single mention of brazil?? What is that? This article is so disrespectfull to African teams but anyway i understand where the writer is coming from. This is an african world cup, played on african soil so be prepared to be shocked. Hey Pedro, I think you got it seriously wrong this time. First, an African team will make it to the semis. Second, Brazil is in that final already. That team is seriously focused right now. thanks pedro for your opinion but i highly douht if the dutch can go beyond the quarter finals the way fixtures are and if all goes according to plan that the favourites will lead their groups then a spain/italy/england vs brazil final is looming on july 11th.brazil dont have the flair this time but the group is more determined this time than before as defencively and the goalkeeping section this time around is more stable than ever before i think BRAZIL WILL WIN THE WORLD CUP 2010. Pedro made a political correct prediction with a dose of unconventional approach! Argentina beat the german team a few month ago. 1:0. They are in good shape and have excellent players like Higuain, Messi and Tevez. Im from the Netherlands, although we have a great team we never had the killer mentality to actually win the tournament. I see that holland has the underdog status from the fans but coaches aren't folled easy. Robben will return for the first game as his 'wound' wasn't severe. The key point is Holland vs Brazil if they go through that Holland has a big chance. Argentine will be the dissapointment of the tourney Messi is a single player and only a team will be champion. If Brasil defeats the Dutch they are the next champion. I would have love your prediction to be true but Man Ghana will be playing a south american country in the final. Ghana and south Africa will surely go through to the semi-final stage. Where is Brazil in your prediction? Holland's best bet is a Quarter final ticket. I see Brazil winning all the way to the final. Tournament best will be Kaka, forget club form. Wow, without having played for 1 second, the tournament is already a success!! Your prediction made my heart jump and it appears that you have read carefully my previous comments! Commenters who set aside the Dutch chances have no clue about the quality in this squad. Making fun of the Dutch defense only shows that these people have not watched recent developments of the team. Finally, it would be a surprise if Germany is not going to surprise the world with solid tournament football. Wow...not even a note that the USA is going to be there. Pedro, you have sidelined Brazil in your analysis, same as Italy. Italy won the same world cup without big names and I still think they will surpise your predictions. Of course individula talent is important, remember this is the longest time these palyers are together in four years. There is need to mention the coaches as they will play a significant. This is why Argentina will not proceed to the semi-finals. All arguments aside, I am convinced that Spain will win the World Cup. I just hope that the referees will not be blinded into making mistakes allowing the traditional teams (Argentina, Italy, Brazil and Germany) a clear path to the semi finals. Holland I think is a great team and so is Argentina. I believe that Nigeria will defeat Argentina and make it to the semi final. You"re totally right, Pedro. The 'Naranja Mechanica' will surprise the world yet again with another display of 'Total Football', a more perfect version this time. Just wait and see. All you non-believers will be surprised. Till that time, it's good to be the underdog. expect surprises, I feel the underdogs and underachievers can spring a surprise..
Nigeria is a team to watch out and any of the African team can deliver the cup.. The Nigerian team,despite the low classed mid-field they are to parade at the tournament,i guess they will prevail into the round of eights!! I dont really agree with your predictions cos i cant imagine the exclusion of brazil & U.S.A....I believe d African teams can spring up suprises....Remember the Confredation cup? In my opinion you have made a great prediction! Being Dutch I hope your right! However I do feel that the expectations of the Argentines are very high. Are they true? I was there when they just managed to win from Peru (on Octobre the 10th 2009) in the last minutes. They had a very tough game and the quality was not good. That said; making their way to the World Cup could have maid them stronger. Gonzalo Higuain and Diego Milito are both strong forwards and in their best shape. And then they have Messi. But the defends is weak. Weaker than that of the Netherlands. It is true the weakest link in the 'Oranje' selection lies in the back, but we haven't lost 19 games in a row. And we keep the ball at our forwards – if the opponents don't have the ball – how are they planning to score?! My favourists: Netherlands, Spain, Brasil. Followed by England and Argentina. Overachievers: I agree on Uruguay, but I like to add Mexico (which has strong players – they will go far. Potugal and the US – that has surprised me. Also one of the African nations will do well: Ivory Coast is a very good team, but the poule they are in is the most difficult one, in my opinion. South Africa has a good chance too. Don't forget they performed well in the Confederations Cup. But, they are in group A which is strong too. So Nigeria might have the best chance to get far in the tournament for Africa. The biggest underachiever will be France. All in all, we will be seeing a great tournament! By the way: Sorry to hear from Nani. That is a great loss! Greetings from the upcoming World Champions. Greetings from Holland! Pedro, did Brazil´s name ring a bell? Brazilians had a lot of experience in WC. I agree to include Brazil in the discussion. But Itsn´t Leo Messi the best world player in this year ?? – Argentina hasn´t chances ???. The Pinto´s comments are right . The brazilians couldn´t believe that no mention about them in the article. By the way in others WC they won and the had the best soccer that year. But this year the winner is ARGENTINA !!!!!!! The Netherlands is quite strong. The midfield and attack are seriously world class, the defense is mediocre, but whats weak is our bench. That is the real problem with the Netherlands we cannot afford send off's or injuries on some critical positons,and i've yet to encounter a tournament where players do not get suspended or suffer injuries in the course of the tournament. Sides like Brazil and Argentina leave world class players at home. What of nigeria,they are going to shock the whole world. I too agree with Pinto.......Holland have a fantastic team this time round....and the most important part being they are keeping their ego's in check and playing for each other......I am sure if they do not implode before the Quarters...Holland will go on to WIN 2010. I agree with Pedro's analysis. I initially picked Spain or Holland to win this tournament. Germany is always a threat in every tournament and they cannot be easily discounted. The Italians will mirror the performannces of Juventus and AC Milan in the season just ended. They were taught a lesson during the Confederations Cup and this is likely to continue in this tournament. Just one thing worries me: No European country has won the WC outside Europe. Only Brazil has won the WC outside its own continent. I think it is about time for US to do a nice soccer word cup. Remember the last Conferation cup? They beat Spain 2 x 0 in the semis and were winning Brazil 2 x 0 by the end of the first half. Well, than Brazil reacted... Anyway, I still think US has a good shot. I hope so, at least. How about Portugal? I could see them doing a great tournament. Semifinalists I predict. CR9 will shine. I will watch out England, they could reach the final; the other favorite team is either Brazil or Argentina that will fight for one final spot. I think loads on here under-estimate the Dutch team. I strongly believe that if the Dutch would meet Brasil in teh quarter finals ( which would be very likely), it could be the game of the tournament-whatever the outcome. If the Dutch would win..they certainly could go all the way. I think Holland, Argentina, Portugal and Brasil have the most difficult journey if proceeding thru the tournament. Where Spain, UK etc somewhat easier.... But If you want to be champion you need to be able to face any opponent and come out on top. I hope Holland can go all the way. Pedro....cmon. the Oranje? im saying england vs. spain in the final. Capello is up there as one of the best managers in the game and the transformation England has gone through since Mclaren left has been outstanding. Spain has one the the best squads on the planet (if not the best on paper) with that euro in their cabinet, they'll be looking to win their first ever world cup after such a depressing past. I think their biggest threat is Argentina tho who might cause an upset at the semis. England CAN BEAT Brazil and will be hoping for revenge from 2002 which would be very very sweet indeed. And no, it wont just be rooney who brings them that far. i have followed Mr Pintos reporting on CNN for some time. How can someone that is supposed to understand anything about soccer write a whole article and not even mention Brazil. Not that I personally believe we will be champions, but a team that represents a country who stands alone with 5 wins, simpy not even be mentioned in his supoosed preview of what is going to happen in South Africa. Just like u Pedro, i predicted that inter will be winners in the champion league...but in the world cup i will go with Argentina because history tells us teams who have faced difficulties in qualification r will always, more strong on the finals....and those teams perfect in paper like Spain, England,Brazil...will end their run a little short...Hollands r out of those groups and quite wright they will a dangerous team in the finals but the player collection, i found them less strong for the Latin Americans......so i said the team with very good midfield and perfect attackers with a whole counter attack mentality which is Argentina, will win the world cup!! Netherlands vs. Argentina in the Final??? Netherlands winning it all?? No way.... I predict neither of these two will reach the semifinals! I think the best team right now is Spain... So, the next World Cup Champion will be Spain...! Pedro, Pedro...you don't even mention your homeland Portugal, which is also the country where the best player of the world belongs. I see Portugal as a strong outsider that can go further than everyone's expectations. Almost everybody goes for Spain, Brazil or England – and indeed they have the best teams – but how many teams did the initial favourites actually win the world cup? Argentina and Brazil in '06, France in '02, Brazil and Argentina in '98 Germany and Argentina in '94, Italy and Holland in '90 and so on and so on. The world cup is a good competition for big surprises, it has always been and I think this one will be no exception. It takes one bad day to knock a team out and in a clash between the traditional strong teams (Argentina, Brasil, Germany, Italy, Holand, England, Portugal, Spain and France) no matter how favourite one side can be, there is always a big chance for the underdog to win. So even though Brazil, Spain and England can be better now you can't exclude the other 6 from the fight. And of course, the overachivers, there is always at least one. I'd pick Serbia, USA, Paraguay, Nigeria and the eternal promise Mexico. Happy World Cup everyone, let's hope for a good one. Pedro, for your information, since 1982, there was not a final without Brazil neither Germany. Not considering Brazil it is a lack of respect for the five time world champs. I think Brazil will get to the finals again despite the Argentinians. Please do not forget the history. An African team vs South American team is not an impossibility. Remember Cameroon beating Argentina and Columbia in World Cup 1990. Remember Nigerian beating Brasil in Olympic final. Remember Cameroon beating Spain in Olympic final. So please do not underestimate African teams especially on their soil. This is Africa time. I hope to see at least two African teams to the semifinal. No matter how it goes let us all enjoy it and Vive l'Afrique. Intriguing to see Brazil out of this predictions... The Brazilian squad is a very solid one, with no superstar this time, but a bright constellation on the horizon. They’ve won everything on the way to the Cup, even the much heralded Argentina didn’t stand a chance. Pedro, did you forgot last year’s Confederations Cup winners?!?!? Better think again!! this world cup final has spain written all over. Spain 2 x 1 Brazil. Its about time spain makes it, plus, in 2014 world cup will be in brazil, will be close to impossible to beat brazil at home. so it will be odd for the same country to win twice in a row, even brazil who did it in the past. Spain 2010, brazil 2014 and thats that. By the way the best way to predict who will win is to look at the odds from bookies, brazil and spain are by far the highest winning odds and its proper, reflects reality. Spain your time has come. ....mayb holland vs spain in the finals bt either way i agree with u pedro dat holland wil win the cup...argentina's wrongdoin wil b nt taking zanetti 2 s.a!! PEDRO, u got it right at the champions league but i doubt it this time . watch Nigeria Vs Argentina first b4 ur prediction. Hmm, the Netherlands are surely a logical Option, but Honestly I do think that the Biggest Names in this year's Coupe De Monde are going to be England and Brazil. Brazil, for they are the most successful squad these 2 years, A Copa Libertadorous and The Continental Cup ... Well those speak Pretty Loud for achievements. Also the fact that Donga has an excellent squad to compete! England, Capello! That coach does not LAND anywhere without achieving great things, and having such an efficient team such as the English Squad with Deadly Strikers Such as Rooney and Great Midfielders such as Lampard and Gerrard, I'd give Capello-England good chance of reaching the finals. The Italians have such a Diesel-Like-Performance. It takes them quite a while to warm up and start bringing in the good results. As For Lippy, don’t underestimate the Coach…never. Messi, Messi, Messi, Messi ... I didn’t see him since the Internazionale match and I doubt he will be that effective in the world cup finals ... Higuan is to achieve more for sure. In the End I just hope this comes out as a crowning achievement for The African Continent In General and South Africa in particular .. and may the best Squad Dominate. Holland wont go past the first round. Denmark and Japan will. people should be optimistic i agree, but for an African tean to win the World Cup? I totally disagree even though i am an African. Infact i can only see one or at most two teams from Africa being in the last 16. But certainly not Bafana Bafana. If people expect them to win the world Cup because of Vuvuzelas, i can only feel sorry for those. People tip the Netherlands to win, they do have some quality players however they do not have the mental capacity to win such a tournament. If you look at Germany, on the other hand, they don't have such a high standard of player as some of the other squads but guaranteed they will be there at the end. The Germans know how to play tournament football and it would be a foolish man to bet against them!! This is rich!!! So the assumption here is that African teams will be cheering on European teams and probably even wiping off their sweat on their way to glory? All this in the home turf of African teams under the helpless watch of the mighty Vuvuzelas? We will be blowing those Vuvuzela. Dont easily write off the african teams so easily.In football or sports generally home support is an advantage. Pedro you are top notch and absolutely spot on on this one....I don't know who they might end up meeting in the finals but i honestly think its time for Oranje to deliver something special. Coupled with the tremendous support of the Boer population in South Africa not to mention a technically gifted and excellent squad, they seem a unified bunch unlike previous talented Dutch squads. Go HOLANDA!!!!!! I agree with Netherland will reach in final but with spain and the top scores will be David Villa the best player will be Kaka.I wish u good stay in South Africa. Even Brazil's reserve team can win the world cup. I don´t understand so much about football. However, I am sure that Brazil is a team of stars. Many of our soccer players are playing in Europe and have been important for the European League. Please, give us your impressions about Dunga´s team. the netherlands have a good team and they have good chances, but i dont think theyll reach the final. Your predication is right about champions. Netherlands will be the winner. Messi is a world star player but with NIgeria he will be noting. NIgeria will win Agentina by 2 to nothing. Netherlands? this is laughable,how could they make it to the semi finals not to talk about finals? I think that Brazil will lift the cup and Ghana or Cote d' Ivoire will be in the semis. But, bro. you have your own opinion. Pedro is an enthuastic foottbal guy as everyone else in this blog. My opinion is,and history backs me up on this one, the World Cup winners are the same all the time. There have never been surprises. So let starts with the previous winners in most wins order. Brazil, Italy, Germany, Argentina, France, England... and lets forget Uruguay for the sake of this comments. So pick your winner from that list because the rest of the teams are there to just fill in. The question is: What does it take to win the World Cup? I will tell you this: have you heard the power of belief before? It will just take that and only that to win it all. But that comes with history and those teams have that history and those players have grown up believing in that their entire lives. I predict that Germany will at least make it to the Halffinals maybe even the Final. I don´t get why people say that they´ll go home early?! In 2002 they just lost to Brasil in the Final, followed by a third place in 2006 and they are the current Vice-European Champions. I hope that Marko Marin will get his chance. He´s pretty gifted and the best thing is, he´s one of the last Dribblers in the Bundesliga and it´s so much fun to see him play. It would be shame to see him sit on the bank. Here we go again. This shows your ignorance of the world cup preparations. Of the 32 teams now in south Africa there are only 6 teams that did not loose one game during the qualifications. One of those is Nigeria. you never learn from History. Remenber U S A 94 Nigeria beat both Brazil and Argentina. I think you forgot that Brasil is in the tournament. it would be worth noting that if an african nation made to at least the knockout stages, it would be a victory/achievement on its own. Argentina Vs Netherland Just what i predicted as well but i reckon it will be the South Americans that will kiss the trophy.. Messi is going to turn on his style. I hope France and Spain does well..
Pedro you were on spot with the Champions League prediction. I predict that South Africa will keep the cup where it is. Why: I was impressed with their determination at the Confederations cup which took them to the finals. Trust me that determination has hiked and it will definitely play a role particularly with the home support and weight of history on the shoulders of the players. Anyone looking at gambling sites? they put Spain the first in all of them! and people knows that with money you don´t play..
PS: congratulations for your services for world sport. You and Giles are the best! Well all said and done....... there will be a world cup in nigeria.!!! http://news.bbc.co.uk/sport2/hi/football/world_cup_2010/8730975.stm look at this!! SPAIN should be!! my prediction:Germany will go into final. another team ,I can not guess.But I guess no Brazil. Brazil is the all time favorite so I'd say Brazil is supposed to win it, then again, Spain is the next favorite in my opinion. Other than these 2 teams it will be just under dog luck for all the others. I agree and am sure Pedro's prediction will come out this time. Cause indeed, Bert van Marwijk's players has shown, being able to put aside their big egos in the squad (at least some of them) and also have the ability to work hard for each other. They haven't lost a game since Sept. 2008 and yes I agree, that momentum will help them immensely to win World Cup 2010 in South Africa. Thank you, Pedro Pinto! I'm putting USA and Germany in the final. USA comes in with momentum and not mention they did OUTCLASS and defeat the no. 1 team in the world, SPAIN, in the confederations cup before losing to Brazil in the championship game. I think USA has a very good chance with a lot of big name european stars falling off the map. Pedro Pinto – give me a break – final is Brasil with anyone else and Brasil will win. No ifs ands or buts about it – BRASIL 2010, 6th title, and then we get the 7th in Rio!!! Spain will beat Brazil in the semis and Argentina will defeat England in the semis and Argentina will beat Spain with Messi scoring the winning goal. well you were kinda wrong about LIonel messi there. IF Ill go by the first game that is. A lot of attemots thwarted by the super awesome Nigerian goalie..
South korea is showing a strong form based on t heir first game against Greece and if they keep that up, definitely they wull give Argentina a big headache..
You wrote an excellent article, considering the amount of debate it caused! And, being Dutch myself, I couldn't agree with you more! Let's face it, the Dutch defense isn't as weak as everyone thinks and up front we have 4(!) world class players in Van Persie, Van der Vaart, Sneijder and Robben (who will be fit to play in the tournament). With Van Bommel and De Jong backing them up, we will go all the way. Just remember: when you have the ball, you don't have to defend and you only have to score one more goal than your opponent. And that's something we happen to be very, very good at. But I'm hoping for a Spain vs Holland final. If Holland doesn't win the Cup, than Spain will. In a couple of weeks we'll all know who was right and who was wrong. In the mean time, let's all enjoy the show! do you still disappointed abou the losses of Portugal against Germany in 2006 and 2008 or are you just crazy thinking really Germany go home early? my predictions for the teams that are gonna advance to the second round mexico and uruguay for group a ,for group b argentina and nigeria, groupc england and slovenia ,group d serbia and ghana, group e netherlands and denmark , group f italy and slovakia, group g portugal and brazil,group g chile and spain. In the round of 16 uruguay vs nigeria, uruguay will win, england vs serbia, serbia wins, ghana vs slovenia , ghana wins, argentina vs mexico, argentina wins, netherlands vs slovakia , netherlands win , portugal vs chile, chile wins, italy vs denmark, italy wins, brazil vs spain, brazil wins 4-1. In the quarter finals uruguay vs serbia, uruguay wins, argentina vs ghana, argentina wins, netherlands vs chile , netherlands win, italy vs brazil , italy wins. In the semifinals uruguay vs argentina , uruguay wins in extra time , italy vs netherlands , italy wins be penalty shootout ,the third place match argentina vs netherlands , netherlands win, the final italy vs uruguay, italy wins 2-1.
are you sure about Germany not a favorite? As far as i know they were the powerhouse in Europe and was third last world cup, 2nd last European Cup, and almost always getting there in the semi-finals or finals. I think you were not in Germany last World Cup 2006 or you should have known the german football history. Writing off the germans is a big mistake. IT'S JUST A PREDICTION THOUGH. Anyone can have radical predictions at the early stages of the tournament. ANYTHING CAN HAPPEN. Just look at Serbia last night! What a mistake by Kuzmanovic! And what a game-changing penalty by Gyan. ITS JUST THE FIRST GAME! His predictions might come true, they also might not come true. Whoever predicted that Korea would 2-0 Greece? The Dutch, just like Spain and Portugal, have forever been regarded as underachievers in the world of international football. The Spanish have redeemed themselves by finally winning a major tournament in Euro 2008. They got that chip off their shoulders. I think Pedro might be right and the Dutch might very well go all the way this time round, however they must overcome some stiff competition. Germany are playing good attacking football and I expect Spain, Brazil and Argentina will do the same. Any one of these teams can win it and it is impossible to guess who will bring the cup home. England are as bad as you would expect them to be – unless you're English of course, constantly overrating their team – but I expect to see some improvement! Portugal are a mystery. They can be a surprise to us all, but I wouldn't be surprised if they fail. Sadly I don't see any African teams doing anything more than they have done in the past. They lack discipline and concentration in defense. Keep an eye out for the South Koreans. Very disciplined, fast and tactical. My guess is they'll go far... It's all up for grabs! The guys that presume that the Dutch have no chance of winning it all, know nothing about football or soccer if you will. The Dutch have a great squad and play total football like know one else can. However there are some other competitors to make a good chance like: Brazil, England, Spain and the Germans ( never rule them out). I saw Argentina the other day and they have no chance of winning at all. The midfield is very bad and there defense is even worse. They have some strong attackers but leaving Cambiasso and Zanetti at home will be there downfall. I hope this will be a good championship and that an African country will make it far. I think the final will be between Holland and Spain. That will be the game of the century! they lost against spain thats why germany isnt favorite.spain isnt my favorite either they lost aginst usa 2-0. "I just don’t see too many exciting players in their line-up. As always, they will be solid in defense, but will find it difficult to hit the back of the net." Please make no more prediciton of a game, you don't understand as a american sport-journalist. WC 2010 Final – Germany vs Holland. And Pedro, your predictions are pretty good so far! We almost did not dare to hope, but the Dutch beat Brazil – way to go Oranje! In your defence i thinking the same way at that time. I have to congratulate you on your predictions in not considering Portugal and Brazil to any thing closer to the finals; as well as considering Holland. As for your predictions about Argentina and Germany.... well, you couldn’t get it all right otherwise, you'd be nominated CNN's octopus. overall: good job and well done! HOLLAND WILL WIN THE WORLD CUP 2010. The prediction are pretty accurate. Netherlands as finalists and Uruguay as overachievers turned out to be true, as well as Italy being an underachiever and Villa the top scorer. The only big miss is Germany's prediction, but I don't think anyone would've expected Germany to display this kind of quality football. On June 6th, 2010 7:41 pm ET he writes: "Netherlands? Come on man why dont your research your articles before you post them. Your lack of knowledge is hilarious.. Netherlands?" Great prediction, I am following Dutch football ever since they lifted european championship in 1988 yet throughly surprised to see them in final. they only have play one against the team placed higher than them in FIFA ranking and judging by the 2nd half against Brazil, i have little doubt they will go on to win. At least you were right about Netherlands reaching the final and Uruguay overachieving even though I think the latter did not deserve to be where they were.